Youth programs and services are delivered via a unique partnership between Orleans United Church (Youth Ministry, Young Adult Ministry) and the independent Youth group (OUC Youth). Both organizations are governed independently and work together seamlessly. 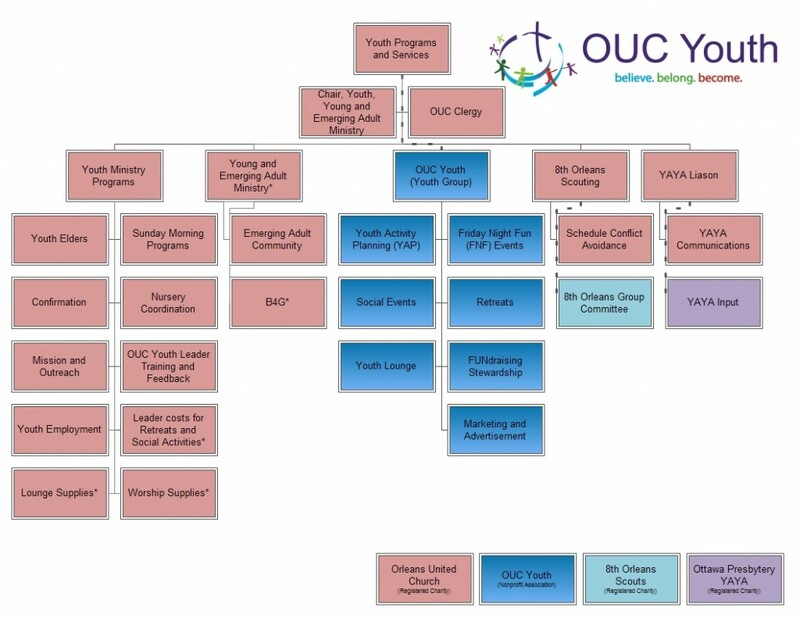 The blue boxes in the diagram below are the responsibility of the Youth group, while the pink boxes are run by Orleans United Church. From September to May, Youth gather each Sunday morning during the worship hour for their own program. Some weeks youth either participate in worship or share in worship leadership, while other mornings they gather in the Lounge for their own worship and faith-based activities. Youth are challenged to put their faith in action, and discussions material elicits critical thinking and value-based decision making. We also have the occasional guest speaker to discuss ideas and concepts that are relevant to our Youth members. The Youth program also takes the opportunity to give back to the congregation and the community. We will “Give Back” our time and talent to the congregation and community. Young adults within the congregation need to have some activities that are geared towards them. Many of these emerging adults that have previously been involved with OUC Youth and currently only attend Sunday morning services. This program was re-launched in 2014/2015 with a series of Beer/Beverage for God (B4G) pub nights, which have proven quite successful. At Orleans United, the Youth Elders are given the same vote, voice, and responsibility as our adult Elders, participating in activities including serving communion, pastoral care, worship leadership, welcoming newcomers. Through this program, Youth are offered leadership and faith-growing experiences as well as providing a source of sustainable Church leadership into the future. Youth Elders are active in the OUC Youth program and have demonstrated leadership capabilities. This program is available to Youth that have been confirmed and have gone through a selection process. Our current confirmation program pairs adult mentors with youth confirmands and together they follow a revised version of William Willimon’s program “Making Disciples”. Over the course of several months youth are offered the opportunity to explore their faith, learn more about the church, and form meaningful relationships in an attempt to allow youth the develop a personal and mature relationship with the church. It is our goal to broaden the horizons of our young people, exposing them to the workings, conferences and gatherings of the church at various levels (local, presbytery, national), as well opportunities for living out their faith through service projects. This program brings forward opportunities for our Youth members events such as national Youth gatherings, or outreach missions abroad. This program is open to all OUC Youth members. OUC has a wonderful partnership with the 8th Orleans Scouting group. Members of our congregation serve in leadership roles within the Scouting movement and many of our young people are enriched by their participation in the Scouting programs. OUC provides the Scouting groups with spiritual support, worship opportunities, and training for the Religion in Life award. The Chair, OUC Youth Ministry is appointed to the role of Sponsor Representative on 8th Orleans Group Committee. All OUC Youth Leaders are required to adhere to a training program that emphasizes youth safety. We have also formalized the role for each OUC Youth Leader assignment so that the expectations are clear and feedback can be provided to Leaders as required. OUC Youth also provide feedback to our Leaders through the use of a year end survey. The Youth Activity Planning (YAP) group was established in 2013 to provide our Youth members the opportunities to plan, coordinate and deliver their own events. They will ensure that OUC Youth social events and activities remain relevant to the needs of Youth members and assist OUC Youth Ministry in longer term event planning. The group consists of Youth members plus the Chair, OUC Youth Ministry to help them as a liaison. This program is open to OUC Youth members that have the time and talent to contribute to moving the Youth program forward. The group meets on a regular basis after the Sunday morning service in the Youth Lounge. We are also going to emphasize that the Youth Leader assigned to this program is an “Adult Advisor”. Based on the 2013/2014 end of year survey, the Youth have asked for more “adventuresome” activities. The request was to hold more events away from the church. YAP will be responsible to planning the new FNF events which will take place 4 to 6 times per year. Along with the chance to learn, worship and grow, youth at Orleans United also love to get together and just have fun. Whether it’s movies, bowling, laser tag, pool parties, or just hanging out at the church, there are monthly opportunities for youth to gather together to connect and socialize in both planned and informal ways. And there is always lots of food!! This program is open to all OUC Youth members. Several times each year youth are offered the opportunity to “get away from it all” for a weekend of fun, faith and friends. The weekend schedule is a mix between faith-based program times and the chance to just hang out, with chores, meals, and special evening events rounding out the gathering. Retreats provide youth with the opportunity to play, learn, and be themselves. This program is open to all OUC Youth members. The space at the end of the hall is affectionately referred to as “the Lounge” – a place for all youth to call their own on Sunday mornings. This year the youth will have the opportunity to design and transform the Lounge into a space that both meets their needs (technology, comfort, functionality) and allows this space to be better used by the church at large. OUC Youth are responsible for the planning, coordination and execution of all Youth related FUNdraising events. The emphasis of these events are on FUN. We will also ensure financial stewardship by making an annual donation back to Orleans United Church. We already have various efforts in place to promote OUC Youth events and activities. What need to place more attention to is our communication to the congregation and possibly externally. We may explore the concept of a newsletter and better use of our program promotional space in the church hall. For anyone needing volunteer hours for school, please contact michaelparsche.